Eight photos of locos at the long gone power stations at Lancaster and Carlisle, and two of former Lancaster fireless locos which survive in preservation. No 1 Lancaster propels No 2 out of the loco shed at Lancaster power station, 9 June 1973. No 1 is Barclay 0-6-0F 1572 / 1917; it came to Lancaster from Port Sunlight in 1924. 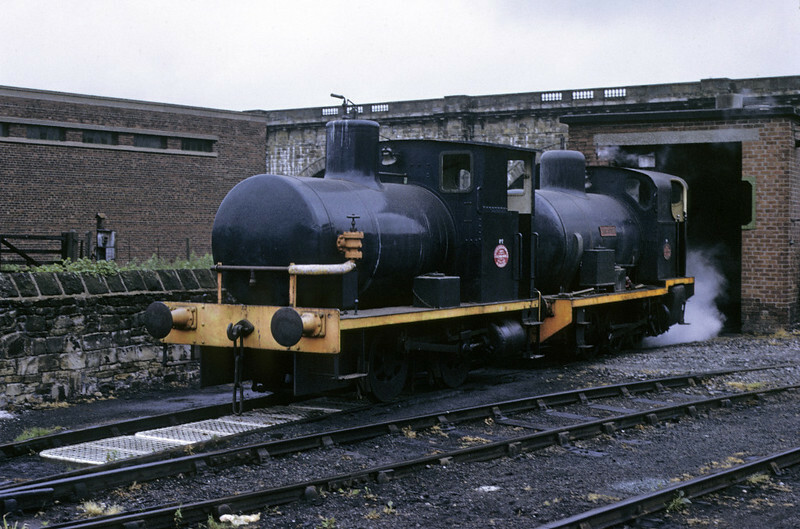 No 2 is Barclay 0-4-0F 1950 / 1928; it was delivered new to Lancaster. They worked at the power station until it closed in August 1976, moving to Heysham nuclear power station in October 1977. Both locos survive in 2011. No 1 is at Carnforth Steamtown in poor condition; No 2 is preserved at the Ribble Steam Rly, Preston. Behind the locos in this easterly view can be seen the Lancaster Canal's Lune aqueduct. Photo by Les Tindall.